advfirewall: Yup, it’s the new firewall. firewall: Yup, it’s a firewall. add: I’m adding a new rule. I also could have used delete along with the rule name and removed one. Or show to see one. Or set to augment one. rule: It’s all about rules. Each rule allows for a port and/or an action. name: Every rule needs a unique name. Namespace conflicts will result in errors. If programmatically creating rules, I’ve found it undesirable to use a counter and instead moved to using GUIDs and a hash table. dir: The direction traffic is flowing. In is for incoming traffic or out would be to block outgoing traffic. protocol: Use the protocol, typically tcp or ump, but if pings, might be one of the icmps. localport: The port that is being used (there’s also a remoteport operator for reflections). profile: I mostly use profile of private. remoteip: Set to any but could be set to a given IP for increased security (yes, I know people can spoof these – so your version of the word might be different. action: I used allow, but could have been block (which denies traffic) or bypass. For further security, I might add a security operator, to allow for an authentication string. You can You might also need to allow traffic for a given app. To do so, let’s add a rule that does so, the only option for which not mentioned above is program, which is the path to the binary we’re allowing: netsh advfirewall firewall add rule name="My Application" dir=in action=allow program="C:\kryptedscripts\kryptedcompiledwebapp.exe" enable=yes To then see the rules and validate that your rules were indeed installed, use: netsh advfirewall firewall show rule name=all The reason I call this quick and dirty is that I’m really only covering a small subset of options. Additionally, it would be a bit more modern to do this via powershell using New-NetFirewallRule or one of the many, many other commandlets, such as Copy-NetFirewallRule, Enable-NetFirewallRule, Disable-NetFirewallRule, Get-NetFirewallAddressFilter, Get-NetFirewallApplicationFilter, Get-NetFirewallInterfaceFilter, Get-NetFirewallInterfaceTypeFilter, Get-NetFirewallPortFilter, Get-NetFirewallRule, Get-NetFirewallSecurityFilter, New-NetFirewallRule, Open-NetGPO (cause you can configure the firewall through a GPO), Remove-NetFirewallRule, Rename-NetFirewallRule, Save-NetGPO, Set-NetFirewallRule, Set-NetFirewallSetting, and Show-NetFirewallRule. A few people have hit me up about issues getting Windows machines to play nice with the SMB built into Yosemite Server and Windows. Basically, the authentication dialog keeps coming up even when a Mac can connect. So there are two potential issues that you might run into here. The first is that the authentication method is not supported. Here, you want to enable only the one(s) required. NTLMv2 should be enabled by default, so try ntlm: sudo serveradmin settings smb:ntlm auth = "yes" If that doesn’t work (older and by older I mean old as hell versions of Windows), try Lanman: sudo serveradmin settings smb:lanman auth = “yes" The second is that the authentication string (can be seen in wireshark) doesn’t include the workgroup/domain. To resolve this, simply include the Server name or workgroup in the beginning of the username followed by a backslash(\). So you might do this as a username if your NetBios name were kryptedserver: kryptedserver\charles To get that exact name, use serveradmin again, to look at the smb:NetBIOSName attribute: smb:NetBIOSName = "kryptedserver"
There are a number of tools available for using Syslog in a Windows environment. I’ll look at Snare as it’s pretty flexible and easy to configure. First download the snare installation executable from http://sourceforge.net/projects/snare. Once downloaded run the installer and simply follow all of the default options, unless you’d like to password protect the admin page, at which point choose that. Note that the admin page is by default only available to localhost. 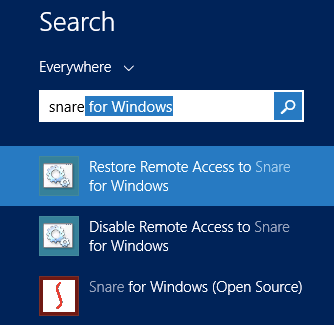 Once installed, run the “Restore Remote Access to Snare for Windows” script. 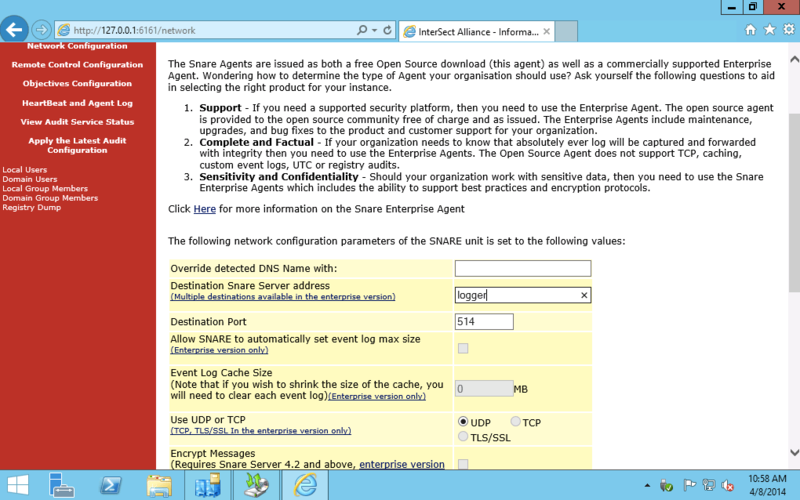 Then open http://127.0.0.1:6161 and click on Network Configuration in the red sidebar. There, we can define the name that will be used in syslog (or leave blank to use the hostname), the port of your syslog server (we used 514 here) and the address of your syslog server (we used logger here but it could be an IP or fqdn). Once you have the settings you’d like to use, scroll down and save your configuration settings. Then, open Services and restart the Snare service. 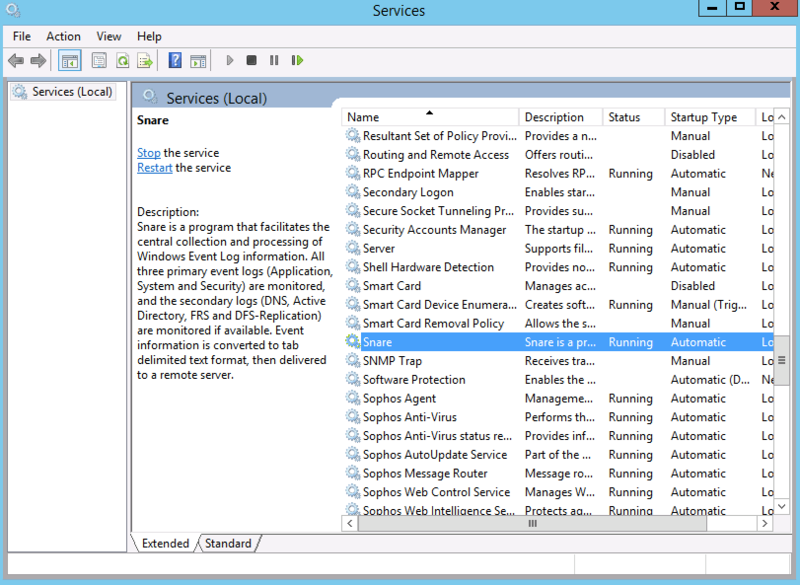 Then run the Disable Remote Access to Snare for Windows option and you’re done. Now, if you’re deploying Snare across a lot of hosts, you might find that scripting the config is faster. You can send the Destination hostname (here listed as meh) and Destination Port (here 514) via regedit commands (Destination and DestPort respectively) and then restart the service. I’ll do another article at some point on setting up a logstash server to dump all these logs into. Logstash can also parse the xml so you can search for each attribute in the logs and with elasticsearch/hadoop/Kibana makes for an elegant interface for parsing through these things. I’ve written plenty about exporting mailboxes from Exchange. But what if you need to perform a selective import into Outlook? This is helpful for importing mail in date ranges, using an import to search for terms (common with litigation holds) and importing contacts and calendars. To get started, click Open from the File ribbon. When prompted, click on Import/Export. 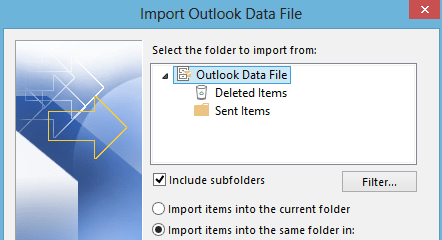 At the Import and Export Wizard screen, click on “Import from another program or file” At the “Import a File” screen, click on “Outlook Data File (pst)” At the Import Outlook Data File screen, choose the mailbox to import into and then click on the Filter button. Using the filtering options, you can choose to import based on date ranges, using search terms, selecting specific folders or a combination of all of these.